A gem or gemstone can be defined as a jewel or semiprecious stone cut and polished for personal adornment. Gemstones produced in the United States and other producing countries are of three types; natural, synthetic, and simulant. The natural gemstones are cut from minerals of crystalline form such as beryl, corundum, and quartz. (Diamond is a crystal of pure carbon.) Organic materials such as amber, coral, fossil, ivory, mother of pearl, natural and cultured freshwater pearls, and natural saltwater pearls are also considered natural gemstones. Laboratory grown synthetic gemstones have essentially the same appearance, optical, physical, and chemical properties as the natural material that they represent. Synthetic gemstones produced in the United States include alexandrite, coral, diamond, emerald, garnet, quartz, ruby, sapphire, spinel, and turquoise. There are also synthetic stones that do not have a natural counterpart. Simulants are laboratory grown gem materials that have an appearance similar to that of a natural gem material but have different optical, physical, and chemical properties. Cubic zirconia (CZ), a replacement for diamond, falls into this category and was first used for the production of jewelry stones in 1976. On the hardness scale for stones, the genuine diamond is a 10 compared to a hardness ranging from 8.5-9 for CZ. CZ has a refractive index (the ability to refract a ray of light into colors of red, orange, green, yellow, violet, and blue) of 2.15-2.18, compared to 2.42 for genuine diamond. Predecessors to cubic zirconia as diamond imitations included strontium titanate (introduced in 1955) and yttrium aluminum garnet. However, strontium titanate was too soft for certain types of jewelry. Cubic zirconia became more popular since its appearance is very close to diamond as cut gems. The gemstones simulants produced in the United States include coral, cubic zirconia, lapis lazuli, malachite, and turquoise. Additionally, certain colors of synthetic sapphire and spinel, used to represent other gemstones, would be classed as simulants. Colored and colorless varieties of CZ are the major types of simulants produced and have been on the market for over 30 years. As with genuine diamond, CZ is available in both higher and lower grades, ranging from several tens of dollars per carat to $100 per carat for the higher grades. In the past decade, the use and consumer acceptance of synthetic and simulant gemstones have grown. Much of this growth is the direct result of the recognition of these gemstones for their own merits, not just as inexpensive substitutes for natural gemstones. Annual production of U.S. synthetic and simulant gemstones is currently valued at around $20 million, with production of natural gemstones at about two and a half times that. Cubic zirconia is made from a mixture of high purity zirconium oxide powders stabilized with magnesium and calcium. The amount of each ingredient is carefully controlled, with certain additives sometimes being used to achieve a similar appearance to genuine diamonds. Synthetic and simulant gemstone producers use many different production methods, but they can be grouped into one of three types of processes: melt growth, solution growth, or extremely high-temperature, high-pressure growth. Solution techniques for making synthetic gems include flux methods for emerald, ruby, sapphire, spinel, and alexandrite. The other solution method is the hydrothermal method, often used for growing beryl (emerald, aquamarine, and morganite) and quartz. This method uses a large pressure vessel called an autoclave. Other techniques involve solid- or liquid-state reactions and phase transformations for jade and lapis lazuli; vapor phase deposition for ruby and sapphire; ceramics for turquoise, lapis lazuli, and coral; and others for opal, or glass and plastics simulants or imitations. The Vemeuil, Czochralski, and skull melting processes are the melt techniques most often used for gem materials. French chemist Edmond Fremy produced the first commercial synthetic gemstones in 1877 by a melt growth method. These were small ruby crystals and were grown by fusing together a mixture containing aluminum oxide in a clay crucible, the process taking about eight days. These were termed reconstructed rubies. In 1885, larger synthetic rubies made their appearance using a flame fusion process and alumina powder. Later, sapphire, spinel, rutile, and strontium titanate were grown with this technique, also known as the Vemeuil method. The Czochralski pulled-growth method, developed around 1917 by a scientist of the same name, is used for ruby, sapphire, spinel, yttrium-aluminum-gamet (YAG), gadolinium-gallium-garnet (GGG), and alexandrite. In the Czochralski method, powdered ingredients are melted in a platinum, iridium, graphite, or ceramic crucible. 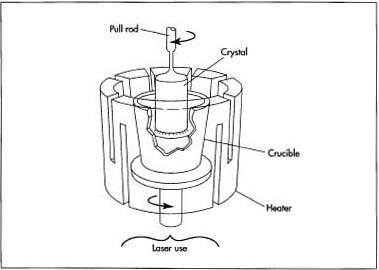 A seed crystal is attached to one end of a rotating rod, the rod is lowered into the crucible until the seed just touches the melt, and then the rod is slowly withdrawn. The crystal grows as the seed pulls materials from the melt, and the material cools and solidifies. Yet, because of surface tension of the melt, the growing crystal stays in contact with the molten material and continues to grow until the melt is depleted. Typically, the seed is pulled from the melt at a rate of 0.0394-3.94 in (1-100 mm) per hour. Crystals grown using this method can be very large, more than 1.97 in (50 mm) in diameter and 3.281 ft (1 m) in length, and of very high purity. Each year producers using this method grow millions of carats of crystals. The skull melt method is used for cubic zirconia and will be described in more detail below. Certain gemstones pose unique problems when attempts are made to grow them. The problems arise because certain materials are either so reactive that they cannot be melted even in unreactive platinum and iridium crucibles or they melt at higher temperatures than the crucible materials can withstand. Therefore, another melting system must be used, called the skull melting system. Cubic zirconia, because of its high melting point, must be grown using this method. 1 The "skull" is a hollow-walled copper cup. Water is circulated through the hollow walls to cool the inside wall of the skull. The cup is filled with powdered ingredients and heated by radio frequency induction until the powders melt. Because water cools the walls of the skull, the powdered materials next to the walls do not melt, and the molten material is contained within a shell of unmelted material. Therefore, the reactive or high-temperature melt is contained within itself. 2 When the heat source is removed and the system is allowed to cool, crystals form by nucleation and grow until the entire melt solidifies. Crystals grown using this system vary in size, depending on the number of nucleations. In growing cubic zirconia, a single skull yields about 2.205 lb (1 kg) of material per cycle. The cut in any stone, whether natural or imitation, depends on the skill of the stone cutter. The cutter must evaluate a gem crystal carefully to determine how much of the crystal should be cut away to produce a stone or stones with good clarity. The cutter must also determine which stone shapes will make maximum use of the crystal. The cutter must make as much use of the crystal as he can, as diamond is too valuable to waste. Proportion plays an important part in the cut of a diamond. An ideal stone is cut to mathematical specifications to allow a maximum amount of light to be reflected through the stone. This type of cut is known as the Brilliant cut. Variations from these set proportions can reduce the brilliance of the stone. When working with diamonds, a cutter might find it more cost wise to vary from these angles in order to remove a flaw or inclusion, yet still retain maximum carat weight. As counterfeit diamond crystals are more moderate in cost and almost flawless in clarity, larger stones can be cut to correct proportions. 3 There are several steps in cutting. First, the stone is marked to indicate cleavage planes and then cleaved to give initial shape to the stone. Since cubic zirconia readily splits in directions parallel to the octahedral crystal face, it can be cleaved using special tools impregnated with diamond powder. An alternative to cleaving is sawing, which is used to remove flawed areas (imitation stones won't have as many) using a small disk of phosphor-bronze impregnated with diamond on its edge. Precision programmable machines are now used to cut stones to a predetermined measurement (called calibration), so that every stone can be produced in the same size, shape, and depth. 4 The next step, called bruting or rounding up, consists of rounding the corners of the cleaved edges. This is accomplished using a machine equipped with a diamond tool called a sharp. 5 After bruting or rounding up, the stone is faceted using a cutting wheel made of cast iron. Polishing follows a secondary faceting operation. 6 The final step is a thorough cleaning by boiling in acid to remove all traces of oil, dirt, and diamond powder. After stones are inspected under a microscope, they are packed in a foam package. The quality of a real or imitation stone is determined by the four Cs: carat, color, clarity, and cut. It is the combination of the grades in all four that determine the final quality and hence value of both a genuine and an imitation diamond. The carat weight 0.0175 oz (0.5 g) of a genuine diamond is the weight of the stone in carat weight. Synthetic stones are always heavier in carat weight than genuine diamonds, as the material they are made of is more dense. The color of a diamond can effect its value. Complete absence of color represents the high end of the scale, and pale, unevenly tinted stones comprise the lower end. Diamonds with an unusually high degree of color are known as fancies, and are graded by the evenness, rarity, and tone of the color. Both genuine and cubic zirconia diamonds are available in various colors ranging from palest yellows to brilliant reds. The clarity is the clearness or transparency of a stone. In genuine diamonds, clarity is determined by nature, minute mineral traces, and small crystals of imperfections that can cloud a stone. The clearer the stone, the more valuable it is. The clarity of a counterfeit diamond can be controlled in the lab. However, bad melts can produce stones with small inclusions. Variations in the metal oxide mixtures can change the color of the stone. Uneven coloration is as undesirable in a counterfeit diamond as in a genuine diamond. Of the four Cs, the cut is the most important in determining a diamond's brilliance. In 1919, Marcel Tolkowsky, a third generation Antwerp-born diamond cutter and student of mechanical engineering, determined the proper proportions at which a diamond should be cut to obtain maximum fire and brilliancy. This ideal, known as the Brilliant Cut, is an objective measurable standard. Each brilliant cut diamond has 58 facets, cut at precise mathematically determined angles to reflect and refract maximum light rays. This guarantees that a diamond has been cut to its best possible proportions for optimal beauty rather than simply to maintain maximum carat weight. In fact, diamond proportion and finish grades are defined in terms of the degree of departure from this standard. In the skull melt method to grow cubic zirconia, a hollow-walled copper cup is filled with powdered ingredients and heated by radio frequency induction until the powders melt. Circulating water within the hollow walls cool the inside wall of the skull. Because water cools the walls of the skull, the powdered materials next to the walls do not melt, and the molten material is contained within a shell of unmelted material. Therefore, the reactive or high-temperature melt is contained within itself. When the heat source is removed and the system is allowed to cool, crystals form by nucleation and grow until the entire melt solidifies. A single skull yields about 2.205 lb (1 kg) of cubic zirconia per cycle. This standard is also applied to imitation diamonds made from cubic zirconia. Although the 58 facet brilliant cut is known as the standard measurement of quality in the cutting industry, there are special instances when deviations are necessary. Too much light refraction in a small area reduces clarity, therefore extremely small stones may be cut with fewer facets. Larger stones may be cut with more facets for the opposite reason. The size of the stone may so increase the width of the facets that brilliance is lost. It is not unusual to find diamonds one carat and up cut this way. With the introduction of new cuts like the radiant, princess, and trillion, the demand for multifaceted stones has increased. There are a variety of shapes that can be cut. The round delivers maximum brilliance, dispersion, fire, and is the most popular of all genuine and imitation diamond shapes. The oval has an oblong shape, a slightly elongated form. Facets around the top portion of the stone are very similar to the facet arrangement on the round stone. For this reason, a well-cut oval diamond gives off a sparkling appearance, catching and reflecting light from all directions. The time (eight to 10 hours for one carat) required to cut an oval is roughly twice the time needed for cutting a round stone because it takes more time to do the primary shaping. Other testing methods are used to measure optical and physical properties. A binocular microscope is used to look for defects such as inclusions. The refractive index is measured using a refractometer. The specific gravity of a stone is determined by seeing whether it will sink, float up, or remain stationary in a liquid with a known specific gravity. According to industry experts, the market for cubic zirconia jewelry is expected to maintain a stable position as mass market retailers continue to offer it to their customers and price continues to decline. Cubic zirconia is also becoming more profitable as a substitute for genuine diamond in stud earrings, the diamond solitaire and the tennis bracelet. In other words, it is no longer being considered just a cheap imitation, especially with improvements in brightness and reflection. An overall growth rate of about 10% is thus predicted for the market. Though a new diamond simulant has recently been introduced called synthetic moissanite (a crystallized silicon carbide), the higher price and more difficult process of this material will limit it competing with cubic zirconia. Erem, Joel E. Gems and Jewelry. Geoscience Press Inc., 1992. Anonymous. "New Diamond Simulant to Debut." Jewelers Circular Keystone (December 1996): 32. Janowski, Ben. "The Diamond Alternative." Jewelers Circular Keystone (June 1997): 146-148. DeGrado, Inc. PO Box 1211. Mandeville, LA 70470-1211. D. Swarovski & Co. http://www.swarovski.com . U.S. Geological Survey. http://minerals.er.usgs.gov/minerals/pubs/commodity/gemstones/ .